With 2019 marking 50 years since David Bowie’s first hit, “Space Oddity,” Parlophone is set to release a 7″ vinyl singles boxed set of nine previously unreleased recordings from the era during which “Space Oddity” was first conceived on April 5th. The title, Spying Through A Keyhole, is a lyric taken from the previously unknown song “Love All Around” and though most of the other titles are known, these versions have never been officially released until late last year when Parlophone made them available on streaming services for a limited time only in December 2018. Most of the recordings are solo vocal and acoustic home demo performances, unless otherwise stated and appear in physical form on this set for the first time ever. 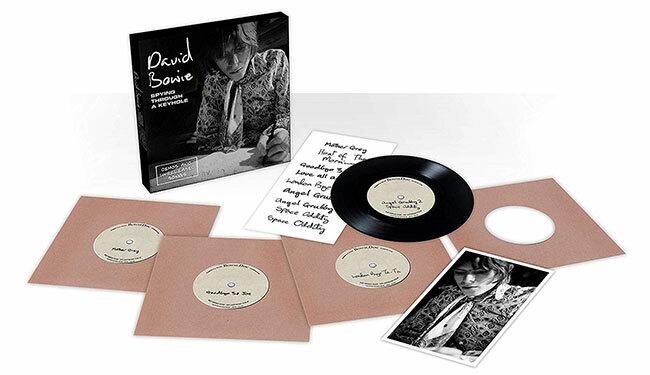 The design of each single label is presented to reflect the way Bowie sent many of his demos to publishers and record companies, featuring his own handwritten song titles on EMIDISC acetate labels. The singles themselves are all mono and play at 45 RPM. Due to the nature of some of the solo home demos where Bowie accompanied himself on acoustic guitar, the recording quality isn’t always of a usual studio fidelity. This is partly due to Bowie’s enthusiastic strumming hitting the red on a couple of the tracks, along with the limitations of the original recording equipment and tape degradation. However, the historical importance of these songs and the fact that the selections are from an archive of tracks cleared for release by Bowie, overrides this shortcoming. “Mother Grey” (Demo) – This mid-tempo tale of a fledgling son fleeing the nest features multi-tracked vocals, guitars and harmonica from Bowie. “In The Heat Of The Morning” (Demo) – A well-known early Bowie song but presented here in demo form with final lyrics. “Goodbye 3d (Threepenny) Joe” (Demo) – A charming demo from 1968 not to be confused with “Threepenny Pierrot,” a song performed by Bowie captured for posterity in the Scottish TV production of Pierrot In Turquoise early in 1970. “London Bye, Ta-Ta” (Demo) – An early demo version of the song with completely different lyrics in a couple of the verses compared to those of the later full band versions. “Angel Angel Grubby Face” (Demo Version 1) – The first and only previously known demo of this song. “Angel Angel Grubby Face” (Demo Version 2) – A later version of the same song with alternative lyrics. “Space Oddity” (Demo Excerpt) – The lyric and arrangement variations lend weight to the theory that this fragment is possibly the first ever recorded demo of one of Bowie’s most famous songs. “Space Oddity” (Demo) with John ‘Hutch’ Hutchinson – Originally conceived as a song for a duo to perform, this is the first known version to feature John ‘Hutch’ Hutchinson again with lyric and arrangement variations.